Born in northern NSW in 1922, Neville Bonner started his working life as a ringbarker, canecutter and stockman. He spent 16 years on the repressive Palm Island Aboriginal Reserve where he learned many of the skills that would help him later as a politician. 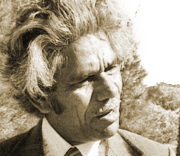 Bonner became the first Aboriginal person in Federal Parliament, representing Queensland as a Liberal Party Senator from 1971 to 1983.